PEPSFAB - a powerful and flexible programming system. CAMTEK Pacific’s PEPSFAB CAD/CAM is a programming system to cover 2D Laser, Plasma, Waterjet and Punching NC/CNC machine tools. It is easy to use and an affordable programming tool suitable for a wide range of Turret Punch Presses, Laser, Plasma, Flame, WaterJet Cutters and Composite machines. A wide range of powerful and user-friendly features of the device offer the ability to quickly and efficiently design and generate part programs for Numerically Controlled (CNC) machine tools, making maximum use of the machine tool and NC control functionality. The product’s design of 3D sheet metal part, unfolding, nesting, detailed display of the solid 3D part and the machined part and comprehensive user controlled simulation of the NC/CNC part program allows a user to generate and prove the NC part program out of the shop floor and minimise machine tools down time. From quick quotation throughout to the 100% machine tool adapted and proven NC/CNC program, the user has support from a knowledge-based expert CAD/CAM system. The ability to import geometry created on existing CAD systems and to use it for NC part program generation is a must in a modern CAD/CAM system. PEPSFAB 4.3 provides DXF input and output in ASCII and binary formats and input of DWG files. IGES input and output provides wire frame support. Text, layers, dimensions and line types are transferred with a user's controlled options; duplicate lines and arcs are eliminated. Geometry repair options are provided including overlap removal, auto joins and auto tangency. Created geometry can be blended, chamfered, stretched and shrinked, transformed and multiplied. Parametric notches and slots are supported. Part's geometry is automatically bounded into a figure and any changes in any figure's instance are immediately implemented. Starting with PEPSFAB 4.3, the 3D component design becomes a standard feature. It allows a user to easy design and visualise a component by adding required flanges with all required shapes. The bend allowance is calculated automatically. By default, DIN6935 Standard is implemented. Any other methods of bend allowance calculation encompassing different standards and materials can be easily implemented using PEPS open architecture. After the component has been designed and checked it is automatically unfolded with the single icon click. Expert provides automatic shape recognition of external profiles, apertures and openings. Expert works accordingly to set up rules and parameters. The preferred parameter values can be set up as defaults and changed by a user if required. To set up Expert, the parameters’ Expert selects appropriate tools and tool sequences for optimum cutting and in seconds generates automatically complete tool paths for part machining. A user can visualise any or all tool paths and graphically edit them if necessary. A user can select Single Part or Full Sheet (Global) optimisation, the direction of optimised machining and a corner of machining start up. Expert provides full ‘look ahead’ with offset checking during profiling of complex geometric shapes. ‘Shared cuts’ are eliminated as the result of full global optimisation. A user can over-ride and graphically re-sequence the tool order; miscellaneous commands can be inserted into the generated tool path. The Micro Tag size is one of Expert’s parameters. Expert places corner and middle tags automatically and practically eliminates this tedious and time consuming job. A user can add, change and remove tags if required. Lead on and lead off settings can be set globally or individually, depending on the geometric feature to be machined. Types of the lead, length, radius and approach move are defined automatically and can be adjusted permanently or for the selected instance. Corner cutting modes include continuous, exact stop, circular loop, straight loop and radius blend. PEPSFAB 4.3 provides multiple repositioning of the sheet. The movement of the sheet is visualised. Care is taken to protect against over travel and clamp cylinder positions are graphically displayed. The part layout is generated automatically according to the machine tool specification and the sheet in usage. Clamps are automatically placed into default positions, clamps positions and default values can be adjusted by a user. Full clamp collision check is performed with visual and audible warning if punching operation is attempted within clamp zones with automatic clamp dead zone calculation depending on the tool station selected. Control of work chutes and adjustable clamps is provided, dependent on the machine tool type. Multi head machines are supported; the number of heads in usage and pitching data are used in layout generation. All tools available to a user are registered in the Tooling Database. The database covers standard parametric tool groups including rectangle, round, square, obround, single and double D-shapes. Special tools can be designed and added to the special tool group. The punch and die key/keyways parameters are used to specify available positions of the tool in the punch and die. 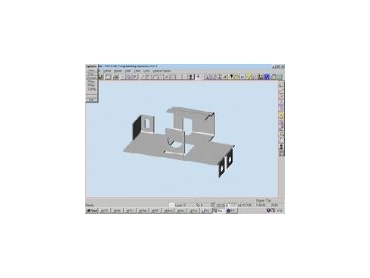 A comprehensive Tool Manager Dialog box allows a user to list registered tools, to add a new tool, to edit or delete an existing tool and to visualise any standard or special tool with all applicable punch and die keys. Flat, form, sheared and profile tool specification options are supported. To minimise set up time, standard turret layouts can be created and used. The standard layout can be created by saving the turret layout of the current job or can be devised as required and used for the current job. Standard layouts can be added, modified or deleted as required. When a user is selecting a turret for the current job, the list includes all available standard layouts, the last layout used and an empty turret layout. Expert loads and configures a turret automatically. A user has options to direct Expert to select the most suitable tools, to use tools from the turret wherever possible and supplement them with available tools if necessary, or to use only tools from the turret and ignore Tooling Database. If the required tool is not found, Expert issues a warning and displays an un-machined area. A user can revise the turret layout and the tool order and change them if necessary. PEPSFAB 4.3 provides a fully automated nesting for the current production run providing manufacturing of the list and number of required parts on the list and number of available sheets. The Parts and Sheets Database contains a library of manufactured parts and library of sheets in usage. Sheet details include material, thickness and sizes. Special shaped sheets can be registered if required. According to the production task, the range of required layouts is generated. All layouts can be revised and adjusted if necessary. Approved layouts are submitted to Expert for generation of correspondent NC part programs. PEPS open architecture allows development of 100% adapted post processors for different types of machines and controls supporting 'canned cycles' and subroutines where applicable. Control of available machine features is provided including work chutes and adjustable clamps. During post processing a comprehensive set-up sheet is automatically generated as well as an NC part program. The set up sheet shows the tools used, station numbers, number of blows with each tool and time for each tool. Calculation of cycle times for individual parts and a complete sheet are displayed at a user’s request. The system includes, as standard, communication software for data transfer to and from the machine using the machine's NC console. PEPS 4.3 is a modular suite of manufacturing applications that can be used to provide NC program generation for various machine tools of the company. PEPS include Punching, Profile Cutting, Milling, Turning, Wire Cutting and Routing Modules. Composite machines are supported, as well as highly specialised machines. PEPS can be used as a stand alone CAD/CAM system or can be integrated with third party packages to form a powerful, yet cost effective CIM solution.